Vintage Zenith El Primero Chronograph: Aloha! 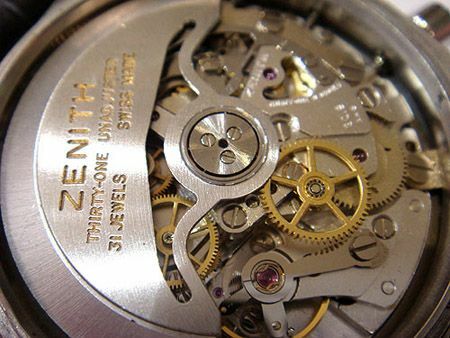 For 8 long years (2001-2009), Thierry Nataf (ex-CEO of Zenith) did a great job in destroying a brand that was one of the few well respected chronograph manufacturers. With flamboyant designs, parties and ditto prices, Nataf knew how to step on the toes of watch lovers and collectors. Zenith wasn’t Zenith anymore. Although the use of certain high-tech materials were welcome, he succeeded in ruining designs. The Zenith Defy and Defy Xtreme watches really make me wonder what people are thinking when buying this watch. Terrible. Ariel Adams of aBlogToRead once did a nice article on the resemblence between Nataf and that other ‘Precious’ Lover. Anyway, since I started using Twitter recently, I stumbled upon the website of Honolulu Time Services, a watch dealer based on Hawaii. After browsing the inventory for a while, I clicked ‘Zenith‘ in the hope that at least it wasn’t one of Nataf’s creations. I was happily surprised to see this vintage Zenith El Primero Chronograph! This fast ticking (36000 beats per hour, instead of the regular 21600 or 18000 bph in those days) movement has a column wheel for the operation of the chronograph. This movement was also base caliber for the El Primero Moonphase, with its caliber 410. The El Primero movement was also sold to other watch brands, like Movado (Datron), Ebel (1911 Chronograph) and ofcourse the famous Rolex Daytona Chronograph that used the Zenith movement in the 1990s. Rolex did downtune the number of beats per hour to 28800. There is no official statement for this, but I suspect it has something to do with their own quality policies. 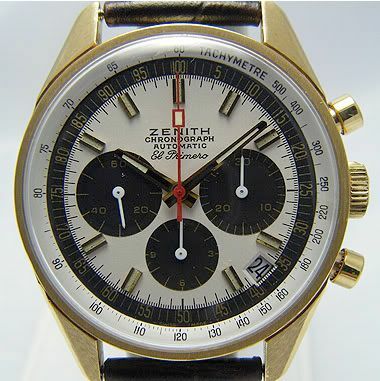 Anyhows, if you are looking for one of the ‘cult chronographs’ in precious gold, take this vintage Zenith Automatic El Primero Chronograph into consideration. You can do a price inquiry at Honolulu Time Services company for this particular stunner.